Do you have a graduate in your family this spring? 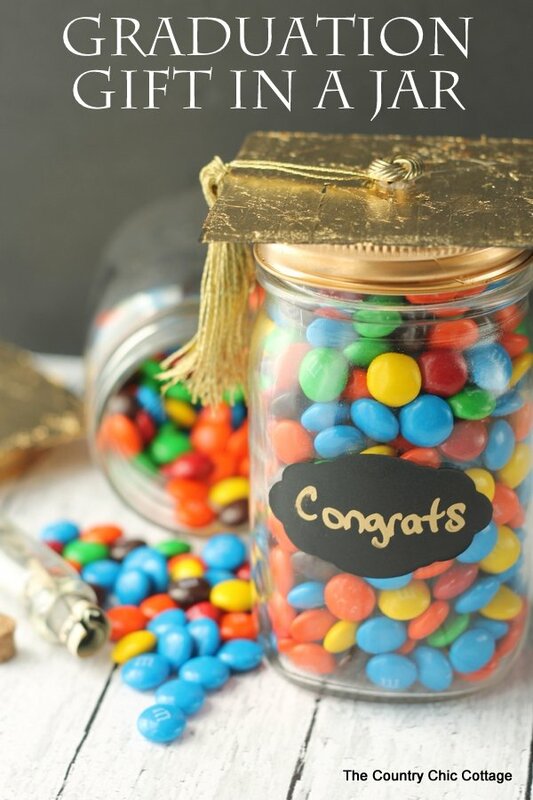 Give them this graduation gift in a jar. This super easy craft idea will leave them hunting for the real gift which is a small jar of money hidden INSIDE all of those M&Ms. Great right? Read on to find out how to make your own. This post is sponsored by Adtech however all projects and opinions are my own. Watch below as I make this graduation gift in a jar in just minutes. Cut black card stock to 3 1/2 x 3 1/2 inches. Cover with the Adtech dry adhesive tape runner. Apply gold leaf. Repeat on the other side. Paint band on jar with gold paint if it is not already gold. Use tape runner to adhere card stock to band. Use a craft knife to cut a small “X” in the center of the card stock. Click here to follow the instructions for making the gold tassel. Tie the tassel onto the button then hot glue the button in the “X” you cut earlier. Add the chalkboard label with a word you painted on with the paint pen to the front of your jar. Add in candy and the small vial with money. 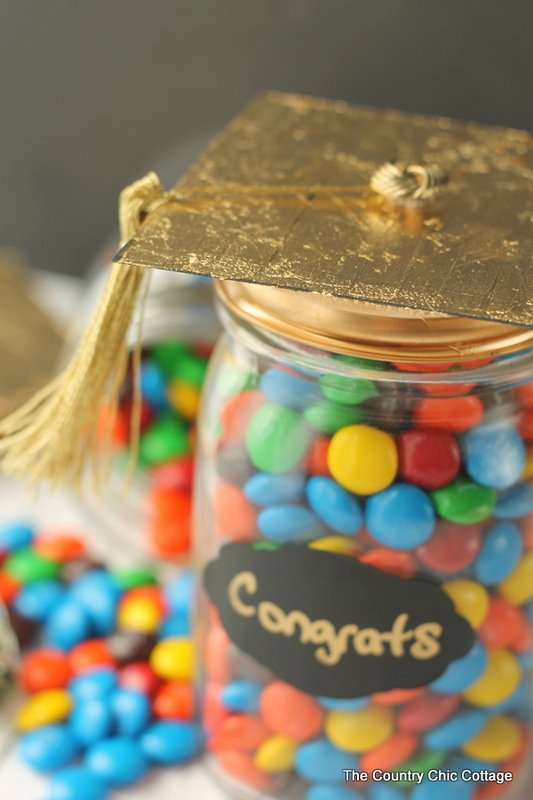 Your graduate will love finding the small vial of money hidden on the inside of their candy mason jar. What better way to celebrate than with a little trick!?!?? 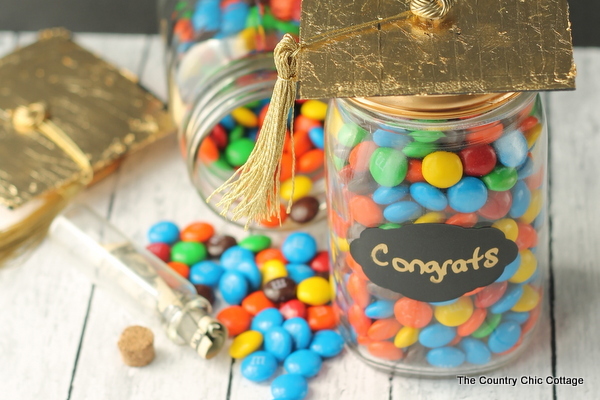 This fun graduation gift in a jar is perfect for graduates of all ages. 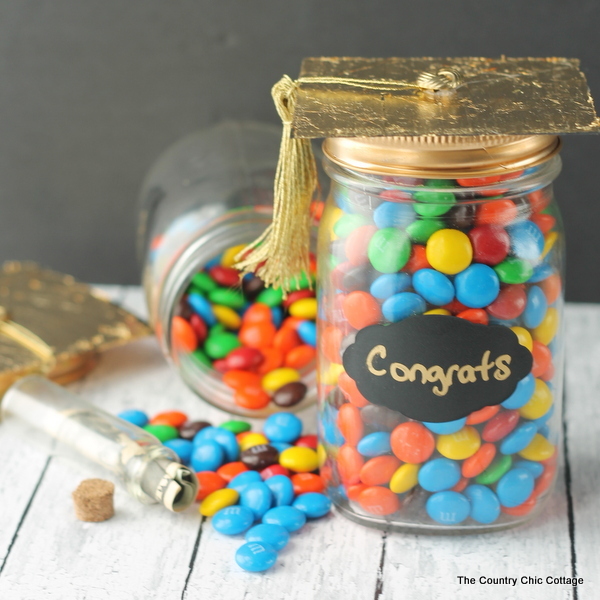 From elementary to college they will love this fun and thoughtful gift in jar. Plus this can be made in just minutes so get your supplies today.